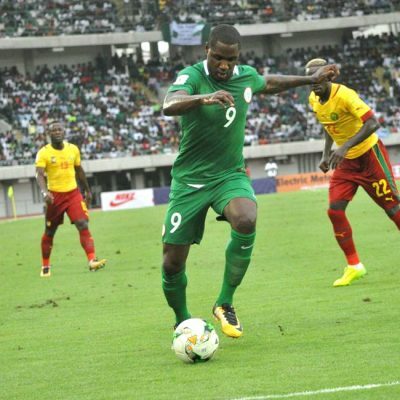 Nigeria head coach Gernot Rohr has reaffirmed his trust in under-fire striker Odion Ighalo by giving him the nod to start for the Super Eagles in Saturday’s 2019 Africa Cup of Nations qualifier against Libya’s Mediterranean Knights. Ighalo has scored twenty goals in twenty five matches for his Chinese club Changchun Yatai but his goalscoring return for the Super Eagles has kept fans consistently calling for his omission from the team. However, in spite of the reported performance of Watford forward Isaac Success in training and a seeming overload of attacking talents, Rohr has opted to start Ighalo in the must-win game billed for the Godswill Akpabio Stadium in Uyo. The former Watford striker will have Arsenal playmaker Alex Iwobi playing behind him with captain Ahmed Musa and Bordeaux’s Samuel Kalu flanking Ighalo. As reported yesterday, Ogenyi Onazi is out of the game meaning that the duo of Wilfred Ndidi and Oghenekaro Etebo will play in the central midfield positions. The biggest news is that of SC Paderborn left back Jamilu Collins making his official debut for the Super Eagles at left full back position in place of Locomotiv Moscow’s Bryan Idowu. Nigeria are currently third in Group E behind leaders Libya and South Africa. Saturday’s game will kickoff at 4pm local time at the Godswill Akpabio Stadium in Uyo.